Focused Blogging Conference 2015 Audio Pre-sale Happening NOW! Are you disappointed that you will be missing out on the 2015 Focused Blogging Conference? Maybe you didn’t have the finances to cover all the expenses for the 3 day conference, or maybe just getting away at this season of your life makes it impossible. It just was impossible for you to make it happen for 2015. What if I told you that you can still grow your blog with all four paths of learning (basic blogging, advance blogging, monetization, social media) taking place at this year’s conference but at a fraction of the price? You may be very happy to hear that for a limited time, there is a PRE-SALE on the 2015 Audio Lifetime Membership that will include all 16 workshops, plus the 3 mentor panels at a special price and bonuses. Several of these workshops were filled up because of the popularity of the topics, but lifetime members will be able to access all of the workshops anytime they desire, as often as they desire, for the lifetime of Focused Blogging Conference. This means that you won’t need to worry about downloading the workshops to your own device, because we will host the audios for our members. The 2015 Audio Lifetime Membership is perfect for newbie bloggers, hobby bloggers, business-minded bloggers ready to increase their profits, brands wanting to improve their reach through social media and for any niche. ALUMNI FOR LIFE – Audio EditionAlumni from the previous conference will be able to get the next year’s Audio Lifetime Membership at an Alumni price of $100, for those who aren’t able to attend the conference. Only during the pre-sale for the 2015 Audio Lifetime Membership is the bonus of ALUMNI FOR LIFE – Audio Edition being made available. The benefit of having this limited audio edition for getting ALUMNI FOR LIFE is that you do NOT have to attend the previous conference to still get the $50 savings on conference you missed, because you will be LOCKED in to this savings for LIFE. Personal Sponsorship: From Proposal to PartnershipThis exclusive ebook, written by Dollie Freeman, founder of Focused Blogging Conferences, is a step-by-step guide to identifying the perfect partnership, writing a winning proposals and follow ups. Samples of her own winning proposals as early as 3 months into blogging and follow ups are included, so you can work to obtain your own personal sponsorship for the conferences you desire to attend. Online CommunityOur online community is currently for attendees only, however during these few days of our pre-sale for the 2015 Audio Lifetime Membership, we are opening up this community to benefit those who purchase our special offer. 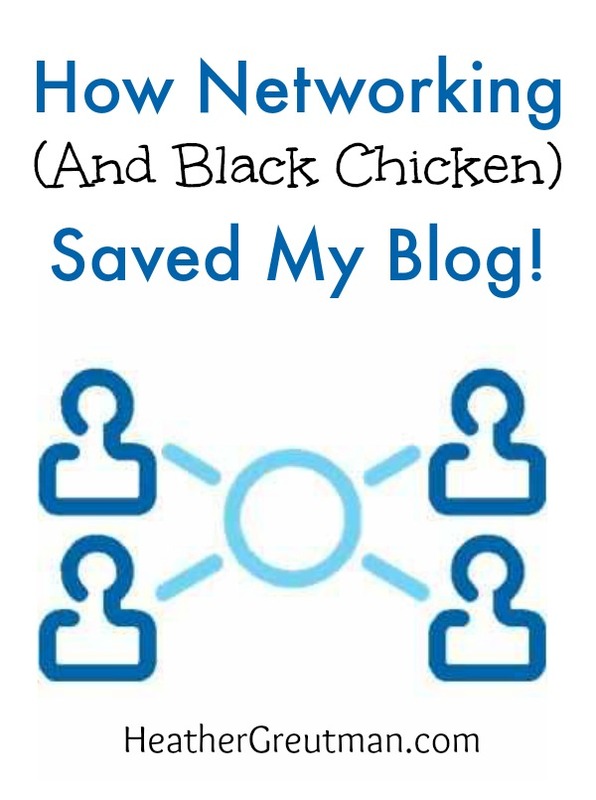 Our community has past topics that were discussed saved for easy reference, as well as future topics that will be discussed leading up to the 2016 Focused Blogging Conference.What our online community offers is to build your blogging knowledge beyond what was covered at the 2015 Conference, a way to further network with attendees and alumni for years to come. Are you ready to join in on the mentoring, and grow your blog with the 2015 Audio Lifetime Membership PRE-SALE price of only $125? 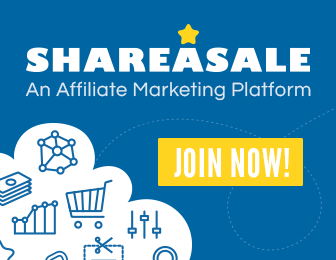 Get your membership NOW, because the PRE-SALE cart will close on July 12th, and the the price will rise to $150, and no bonuses will be offered. I have recently been addicted to Podcasts! When one of my homeschool blogging networks, iHomeschool Network started putting their G+ Hangouts into Podcast format, it really got me into listening to Podcasts! They are so easy to gain huge amounts of information from, even while you are driving down the road! So since I now have this new found love of Podcasts, I have found 3 great blogging Podcasts that I have really enjoyed listening to! All 3 of these Podcasts are full of tons of information! Whether you are a beginner, or seasoned veteran blogger, you will find something in these Podcasts for you! 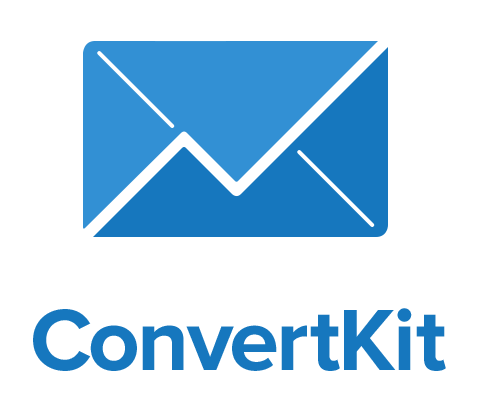 What In The World Should I Put In My Email Newsletter – This is such a good one! I have recently started sending out a newsletter here on HG and I am definitely going to be using her tips going forward! I think my favorite tip of hers was to treat your subscribers like family! An Interview with Erin Odem on Facebook, Pinterest, and More – This one is packed full of information! Kat interviews Erin Odem of The Humbled Homemaker where she shares about her growth as a blogger and how she is using Facebook and Pinterest to grow her blog! Awesome stuff in this one! You can subscribe to The How They Blog Podcast on iTunes or Stitcher for Android users! Legal Issues Every Blogger Should Know Before Starting Their Blog – In this podcast, they interview a lawyer from California on general laws and legal issues you should know before starting a blog! GREAT information in this one! How To Deal with Blog Haters – This is the part of blogging no one likes to think about or talk about! Jeff and Mandy share some of their own personal experiences and how to deal with the nay-sayers that you may come across in your blogging journey! You can subscribe to Dollars and Roses podcast on iTunes! 6 Step Checklist for Improving Old Content – This one is golden! I wrote every single one down and I am going to be headed back to all my old content on my homeschool mom blog and also keeping up with this checklist here on HG! 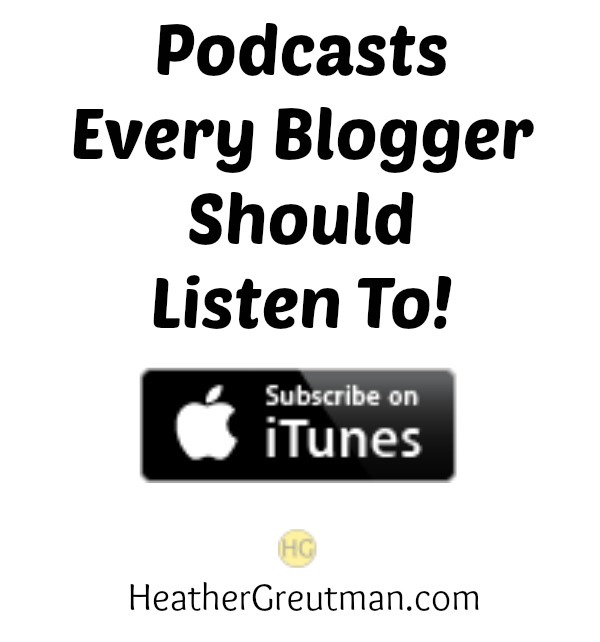 You can subscribe to Blogging Your Passion on iTunes! For blogging tips and ideas be sure to follow me over on Pinterest and my Blogging 101 board! Do you have a favorite blogging podcast? Share them with me below in the comments! I will keep this list updated with more podcasts as I find them or as you tell me about them as well! 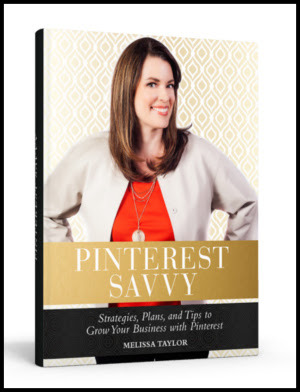 If you own a business or run a blog and have not tried marketing your site with Pinterest, than Pinterest Savvy by Melissa Taylor needs to be on your reading list! Melissa grew her Pinterest following to over 1,000,000 strong (yes, you read that right, over 1 MILLION!!) is just 9 short months!! In Pinterest Savvy, she shares her tips and ideas to help market your blog or business on Pinterest! Pinterest has forever changed the way bloggers and websites market their blogs. It has capitalized on a market already driven by visuals and graphics and made everyone second guess how they are using graphics and ideas to market their products. Bloggers, like myself, have definitely benefited from Pinterest. Pinterest is by far my #1 referral of traffic, by a long shot! Search Engine results come in 2nd with Facebook far, far behind. But it isn’t as simple as just throwing up a picture or graphic in your post, pinning it and leaving it at that. Just like any social media channel, Pinterest has it’s own quirks and ways to bring in the most traffic and followers! This is where Melissa Taylor and Pinterest Savvy can be a huge help to you! If you are wanting to pursue marketing and gaining traffic from Pinterest, then I definitely recommend reading Pinterest Savvy! 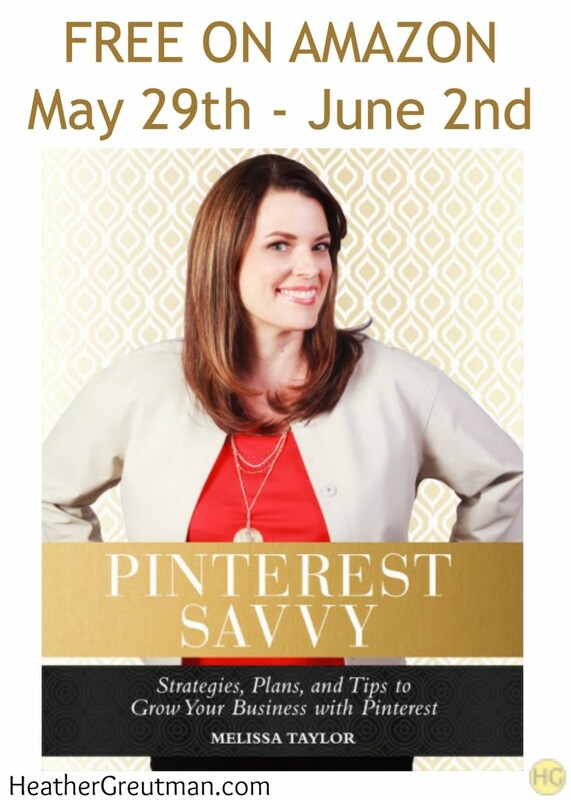 Pinterest Savvy is free on Amazon today, May 29th through June 2nd!! You can also get free chapter guides on Pinterest-Savvy.net. 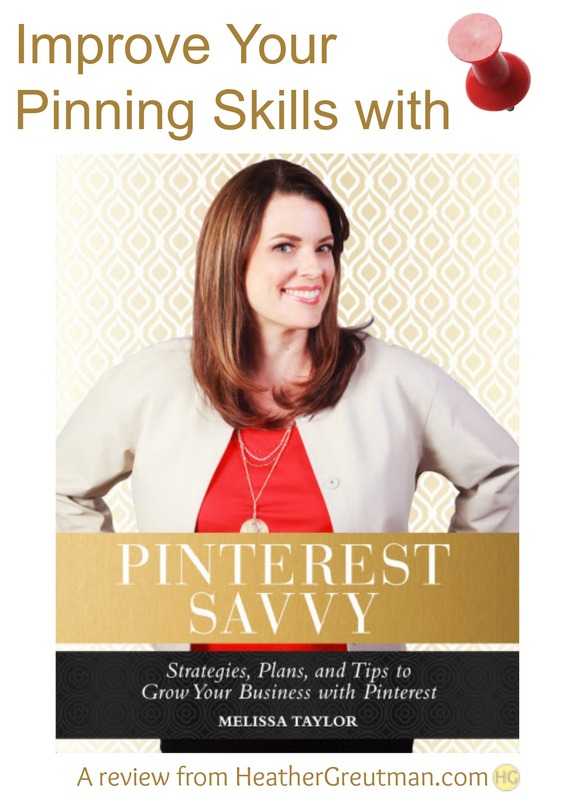 Go grab your copy of Pinterest Savvy today!! For more blogging tips and ideas, check out my Blogging 101 Pinterest board! Follow Heather @ Golden Reflections Blog’s board Blogging 101 on Pinterest. As bloggers, we are always looking for tools to help us get our jobs done quicker and more efficiently. Today I want to share with you 7 FREE Chrome Extensions for Bloggers. I will admit, it took me a while to get on the Google Chrome bandwagon. I am an Apple girl through and through (I love my Macbook Pro, iPad Air, and iPhone!). So I used Safari for the longest time. Until the fateful day when I joined a Pinterest scheduling company that used a Chrome extension for scheduling posts. I drug my feet, but eventually downloaded their Chrome Extension. Then I found the rest of the extensions that I am about to share with you, and my love for Chrome has grown! I no longer use Safari and use Chrome exclusively just so I can use the extensions to make my blogging life easier! 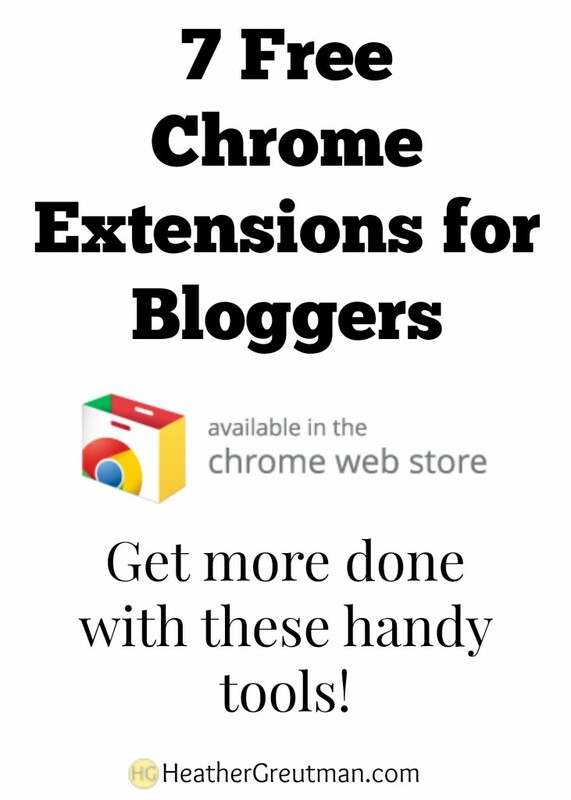 7 FREE Chrome Extensions ALL Bloggers Should Have! 1. Hootsuite Hootlet – Can I just say, this extension sealed the deal for me on using Chrome. Oh my word, if you have NOT gotten this one yet, what are you waiting for?? If you use Hootsuite to schedule social media posts on Facebook, Twitter, or Google + Pages, then you HAVE to get this extension. Instead of logging into Hootsuite, grabbing the link you want to share and scheduling it inside Hootsuite.com, simply go to the post you want to share. Click on the Hootsuite Hootlet Extension button in your browser (top right) and that will bring up a pop up window with a shortened URL and title of the post you want to schedule. Click which channel you want to schedule to, add and edit the post, and then either auto schedule and manually schedule it, all while in the same tab on your browser! I love using this to schedule posts quickly to Twitter! 2. DoShare – If you have been looking for a way to schedule G+ posts to your personal profile instead of your G+ page, then this extension is for you! The only downfall is that your Chrome browser needs to be opened and running for the scheduled posts to actually go through to G+. I have used this one a few times, especially if I am going to be out of town. For the most part though I share live on G+. 4. Eye Dropper – If you make your own graphics, buttons, headers etc. for your website than the Eye Dropper extension can be super helpful! It is an open source extension that allows you to grab any color on any website you see. Great for color coordinating graphics to colors already used on your site. 5. Awesome Screenshot: Capture & Annotate – For none Mac users this extension can be super helpful for taking screen shots on your computer easily. You can grab a screen shot, edit it, annotate it and then immediately share it over social media or save it for your site! Even if you are a Mac user and use the shortcuts for taking screen shots, you may still want to check this extension out! You can easily annotate, add text, blur, hide sensitive information etc. on your screen shots. Perfect for tutorials or step by step direction type posts. 6. StumbleUpon – If you use StumbleUpon to drive traffic to your sites or others in your blogging tribe or group, then the StumbleUpon extension makes it easy to give a “thumbs up” on posts as you are browsing! 7. Strict Workflow – Ah, time management. Sometimes it’s hard to do that in our distractible world of blogging. This extension is an online timer to help keep yourself on tract! It uses 25 minute working windows and then gives a 5 minute break. You can repeat that as many times as you wish! You can even block distracting websites (i.e. Facebook, ha!) while you are in the 25 minute working window. I personally have not used this one yet, but many of my blogging friends suggested it. I think I need give it a try! What are some Chrome extensions that you can’t live without as a blogger? Let me know in the comments below! Confession time: I am a PicMonkey addict! If you have never heard of PicMonkey and are wanting to learn how to use it to make that awesome pinnable graphic you keep seeing on Pinterest, than you have come to the right spot! Learn how to use PicMonkey like a PRO with Monkey See Monkey Do – A Tutorial for Using PicMonkey With Professional Results by Richele McFarlin. 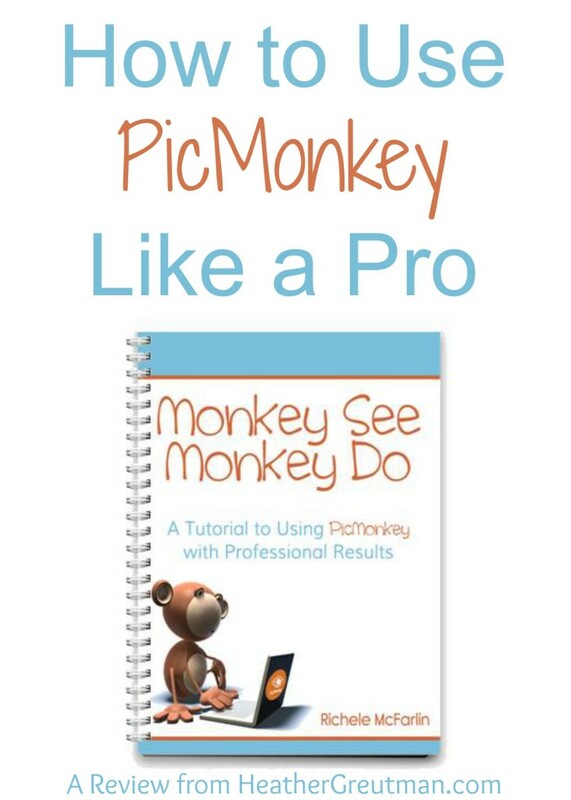 In Monkey See Monkey Do, Richele McFarlin shares her tips and tricks on how to use PicMonkey like a professional graphic designer. After all, she is one! She currently owns Crisp Apple Design which designs a host of things from websites, to business cards and media kits! Monkey See – Here you will learn about color scheme, color psychology and using the right image! 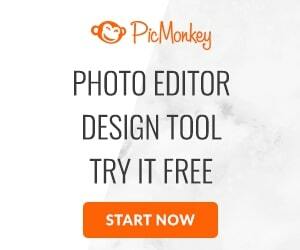 Monkey Do – This is the nuts and bolts of everything there is to learn about using PicMonkey. From how to use all the tools and effects that come with PicMonkey to how to design your own eBook covers, blog headers/buttons and other blogging bling! Richele has really not left anything out in this tutorial! 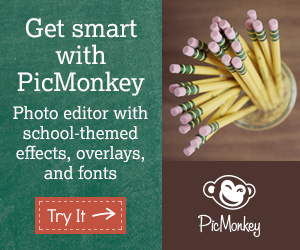 Even if you use PicMonkey every day, like I do, I know you will find something in this tutorial that you didn’t know! For example I had no idea PicMonkey had a draw tool! I know it may be silly of me to have not known that, but now I do thanks to Richele! I think it could come in pretty handy! If you have wanted to learn how to use PicMonkey, how to use basic HTML and how to make a killer media kit, then Richele is the person you want to check out! 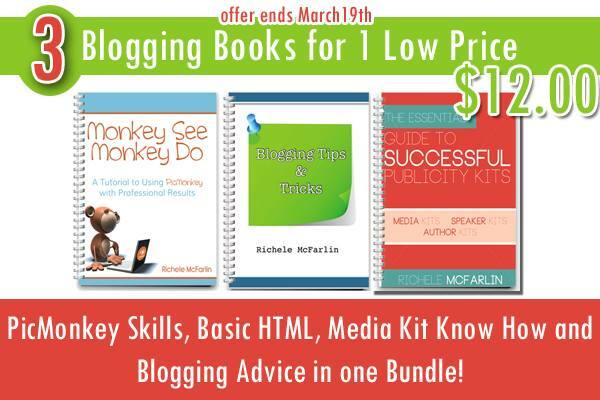 She is offering this amazing Blogging Bundle to celebrate the launch of Monkey See Monkey Do! And it’s only $12 for all 3 of these great ebook tutorials! Hurry and get yours today before this amazing bundle ends on March 19, 2014!! All 3 books are PDF digital downloads. 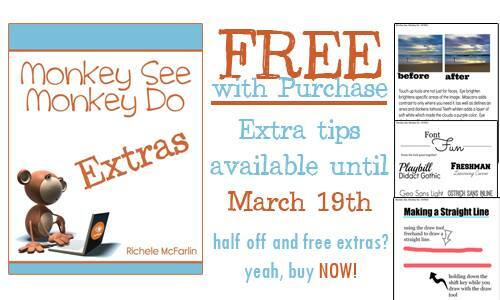 If you would like to purchase Monkey See Monkey Do, Richele is also offering a special for this week only! For only $4, get Monkey See Monkey Do plus all the free extras! After March 19th, the special extra tips will go away and the price will also increase to $8 for Monkey See Monkey Do! This is a PDF digital download tutorial. And if you have not checked out PicMonkey Royale yet, you really should! They are offering the first week free on them! I know once you try it, you will be hooked like I am! I know you will learn a ton from all these great ebooks! Richele is a great blogging friend and is so knowledgeable in all that she does! She will really help you take your blogging to the next level with Monkey See Monkey Do! Disclaimer: I received a free copy of Monkey See Monkey Do for the purpose of this review. All opinions and thoughts are 100% honest and my own. No other compensation was received for this review.